Although this isn’t the Decemberists’ best album, it’s a breathtaking effort that maintains everything that makes them so one-of-a-kind and vital. There really is no other modern band like the Decemberists. Formed 15 years ago in Portland, Oregon, by guitarist/singer Colin Meloy, the quintet never ceases to craft indie/folk rock gems that are catchy yet nuanced, intricate yet welcoming, and above all else, lovably eccentric yet classy. In particular, Meloy's voice, lyricism, and overall compositional style is wholly unique and very rewarding. On their newest record, What a Terrible World, What a Beautiful World, Meloy and company continue this trend, offering over a dozen slices of sublime songwriting and earnest performances. This isn't their best album, but it’s still a great journey from beginning to end. Although the group’s first two LPs, 2002’s Castaway and Cutouts and 2003’s Her Majesty the Decemberists, demonstrated what the Decemberists were all about, most listeners agree that their third effort, 2005’s Picaresque, is when they really started to shine. Chock full of endearing melodies, poignant reflections, and the sort of quirky storytelling that would fit perfectly in a Wes Anderson film, the disc blended musical and literary techniques in an unparalleled way. Its two immediate follow-ups, 2006’s The Crane Wife and 2009’s The Hazards of Love, the latter a tragic conceptual song cycle, however inconsistent, maintained the same aspirations while also delving a bit further into the progressive folk rock influence of Jethro Tull and Fairport Convention. In contrast, 2011’s The King Is Dead scaled back the embellishments for a more streamlined, Americana-influenced approach. In a way, it was their White Album, an attempt to go back to basics after having pushed boundaries so far. Likewise, then, What a Terrible World, What a Beautiful World is their Abbey Road, a more confident and consistent selection of songs without the artsy flourishes of prior collections. This isn’t a bad approach, though, as almost every track is fantastic. Things begin with “The Singer Addresses His Audience”, an acoustic ballad/metacommentary on the expectations and experiences of the Decemberists. Similar to how Panic! at the Disco begins Pretty. Odd. with “We’re So Sorry", this piece finds Meloy literally speaking of the changes the band has gone through over the years. With his typical tinge of melancholy, he reflects, “We know, we know, we belong to ya / We know you grew your arms around us / In the hopes we wouldn't change / But we had to change some / You know, to belong to you." Strings and vocal accompaniment soon complement his self-aware lament, and by the end percussion and various dissonant sounds combine with a luscious chant, creating an anthemic encasing as only the Decemberists can provide. In short, it's a phenomenal way to begin. Next is “Cavalry Captain”, a boisterous affair with endearing horns and one of the band’s most gripping hooks yet. Meloy’s voice has never sounded stronger or more charming, and the backing harmonies add a sparkly retro sheen. It’s as uplifting and dense as any song they’ve ever written. Like the more straightforward “Philomena” that follows it, "Cavalry Captain" hearkens back to the great ‘60s production of folks like Brian Wilson and Phil Spector. "Philomena" also contains some of Meloy’s trademark boyish humor: “All I ever wanted in the world / Was just to live to see a naked girl / But I found I've quickly bored / I wanted more, I wanted more." "Make You Better", the album's lead single, is an ode to aged love that’s not overly sorrowful. The lyrics contain wise poeticism about romantic bonding, dependency, and, as is typical, loss. It’s hypnotic, stunning, and very touching. Meanwhile, both “Lake Song” and “Till the Water Is All Long Gone” are sparser requiems akin to earlier classics like “Odalisque”, Grace Cathedral Hill”, and “The Gymnast, High Above the Ground”. It features a subtle yet powerful orchestration and bellows that make them very arresting and lovely. Melodically, “The Wrong Year” sounds a bit too close to “Here I Dreamt I Was an Architect” to feel sufficiently original, but it’s still solid nonetheless. Interestingly, both the slow burn of “Caroline Low” and the intense awakening of “Better Not Wake the Baby” recall the arid, foreboding nature of archetypal Americana; in fact, either one would fit well on the soundtrack of a Western, as one can imagine the speaker gearing up to draw his gun on a rival. Although they share a slightly similar chord progression, “Anti-Summersong” doesn’t seem to connect to The Crane Wife's “Summersong”, other than to allow Meloy to profess, “I’m not goin’ on / Just a-singing’ that ol’ summersong." Perhaps it’s another truly meta moment. “12-17-12”, another acoustic ballad (with harmonica), is inspired by recent school shootings, with the Sandy Hook killings being the most likely catalyst. Meloy connects fear and uncertainty to his family, decreeing sentiments like “Oh my boy / Don’t you know you are dear to me / You are a breath of life / And a light upon the water”, before making the logical (and title-inspired) final statement: “And oh my God / What a world you would make here / What a terrible world, what a beautiful world / What a world you have made here”. While it’s rather slow and low-key, it’s among the most powerful songs the band has ever written. The record concludes with “A Beginning Song”, a dynamic burst of optimistic closure that leaves listeners wanting more. It’s nothing especially extraordinary or memorable, but it gets the job done. Although What a Terrible World, What a Beautiful World doesn’t quite measure up to the Decemberists’ truest masterpiece (Picaresque) or contain songwriting as gorgeous and moving as, say, the “Crane Wife” trilogy, it’s a breathtaking effort all the same. Yes, some songs, such as “Easy Come, Easy Go” and “Mistral”, are merely good instead of great, but most of the record is exceptional, plain and simple. For instance, it’s easily superior to The King Is Dead, and it’s more focused and better produced than their debut duo. 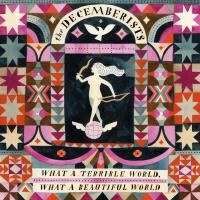 Overall, What a Terrible World, What a Beautiful World maintains everything that makes the Decemberists so one-of-a-kind and vital. They’re still one of the best modern bands around, and this record will surely be regarded as one of the year’s best come the end of 2015.